Like so many large city wish lists, my London bucket list is never-ending. I am still trying to hit the big stuff and prefer to alternate my bucket list between tourist “must do” and “just, not.” I grow weary of shelling out pounds to be bored in a sea of tourist hoards where I join in on a herd like procession. However, discovering some amazing things in the world requires patience in that regard. 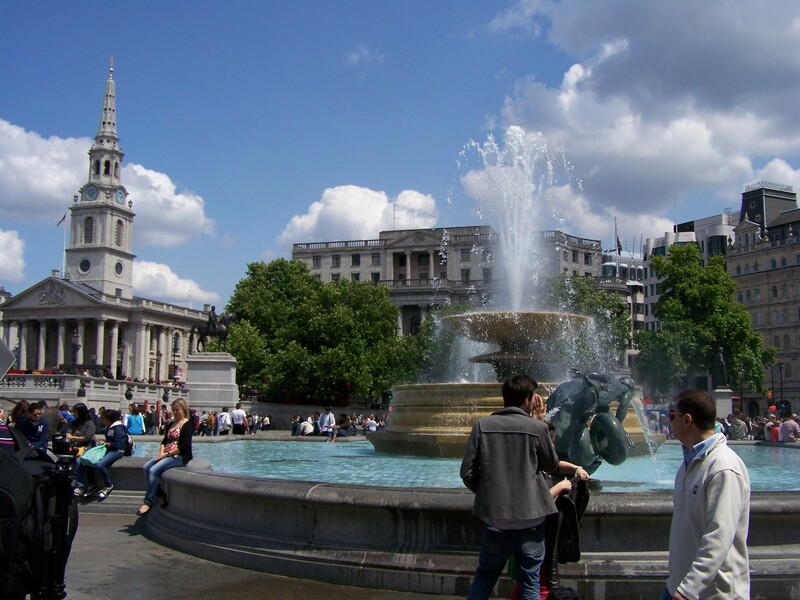 Trafalgar Square and especially The National Gallery were one of those amazing visits for me. For people who pooh-pooh this city, London has recently taken over as “The top city to visit” according to The Readers’ Travel Choice Awards. For me, it is an easy city to visit. I speak the language. The transportation system is a snap, and there is a lot of free fun to be had. On this visit, I had a short amount of time on a purposeful lay over. I made a list of seven things that I wanted to do: The Globe Theatre, The London Tower, find and visit a statue in Trafalgar Square with ties to my family tree , visit The National Gallery, ride a double Decker bus going nowhere in particular, hang in Coventry garden and eat in a quintessential olde English establishment. Trafalgar Square really is the heart beat of this cool city. A must place to visit at least once, and really interesting if you go at a time when there is a State event, a royal affair or naked bicyclists. 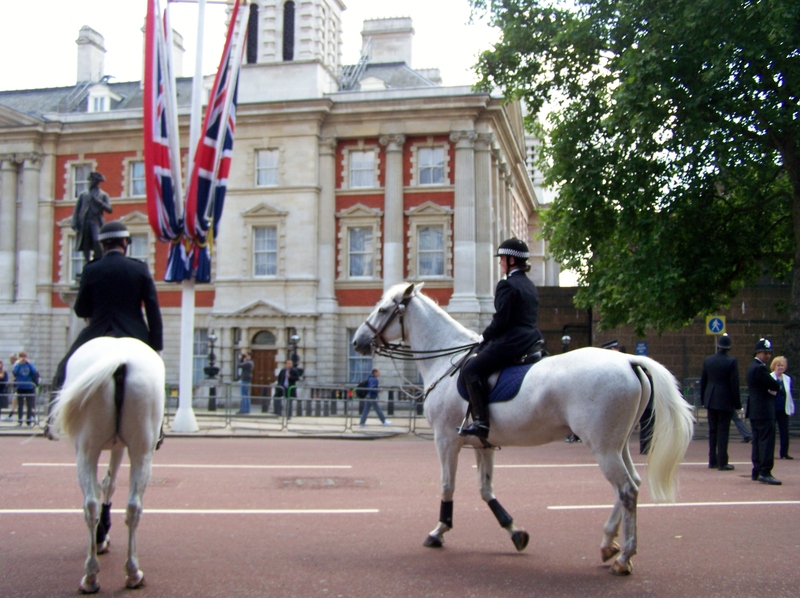 Lucky for me, I was there during the Queen’s Jubilee so there was a lot of buzz and interesting things to look at. The security was fun to check out from the high tech on down to the Mounted Police. I can only imagine how much fun it would be to live nearby and have all year round access to the events: Arts, Christmas, New Years Eve and political demonstrations. And speaking of fun, I was lucky or unlucky to witness naked bicyclists riding around for the World Naked Bike Ride Event. Go ahead, try to top that spectacle. I will spare you the visual. The Lions– For generations, people have climbed those lions at the base of the Nelson columns to snap a photo. 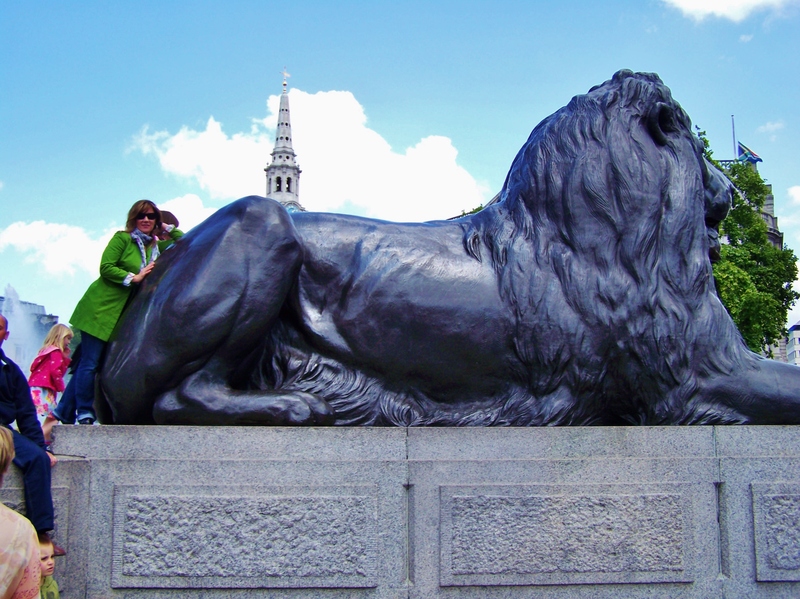 There is a movement to ban tourists from climbing on the lions in Trafalgar Square due to damage-blah blah blah. So this was on my endangered things to do and see priority list. Even though I try not to be an idiot tourist, I sometimes I behave like one, and like it. I can’t explain this desire, so I won’t. I am in decent shape but it was more challenging of a climb than I anticipated. I blame it on my rare case of jetlag. They were slippery and I totally forgot chalk and ropes. I gotta go back. Sir Henry Havelock is in my family tree. 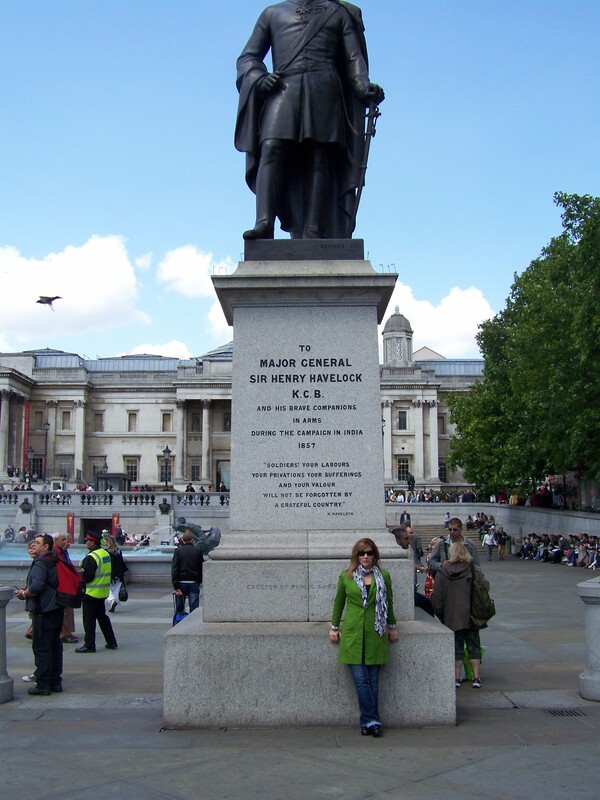 His statue is one of a few in Trafalgar Square. Politics aside, he was a piece of English history. The plaque on the plinth reads: To Major General Sir Henry Havelock KCB and his brave companions in arms during the campaign in India 1857. “Soldiers! Your labours, your privations, your sufferings and your valour, will not be forgotten by a grateful country”-H. Havelock. Getting my photo taken next to this statue was a personal highlight for me. However my “photographer” cut off his head so I gotta go back. National Art Gallery is adjacent to Trafalgar Square. I really really love this place! To say that this museum holds one of the finest pieces of European Art is an understatement. There are 2300 masterpieces and it is FREE. This place is extremely well done with a fantastic website which is well worth exploring before a visit. There is a handy guide with 30 “must see” works. I did that. Monet, Reuben, Leonardo Da Vinci, Van Gogh, Cezanne…ARE YOU KIDDING ME? I am not an art aficionado but it is not difficult to appreciate art and art history while in this place. It personally trips my trigger to observe a painting from the year 1260 and ponder how alike people are on the timeline of this Universe. Rembrandt does that for me with everyday things: faces, rings on a finger, and dogs. I appreciate the frame of reference that I gain when I get to see an original piece of art such as the Monet ‘The Lily Pond” or Vincent Van Gogh “Sunflowers.” Ever think of the psychology behind the artist? The weird, like what the what? There is something very disturbing about a face being eaten by dragons. Thanks for that vision van Haarlem. Even if you think you don’t like art. Check it out. This place is one of my favorite museums in the world. Megastars*****I give it a “10”. I gotta go back. Megatips-Just DON’T overlook this place. Do as I say, and NOT as I do, leave some time into your day in case you end up grooving on the art. Seriously, if you cannot go in person, visit these paintings for FREE on the National Gallery website. Very cool! Go to the museum shop, it rocks. Use the bathrooms in the museum, they are clean! Although it is a free spot, donate some coins to support this amazing place. Practice climbing lions so you can get a photo without getting arrested when using ropes. Finally, take pause and look at the big picture of the square and museum. It is really cool. A great jump off spot for Covent Garden and double-decker buses. ← Globe Theatre, where “All The World’s A Stage”, and I am a mere player!